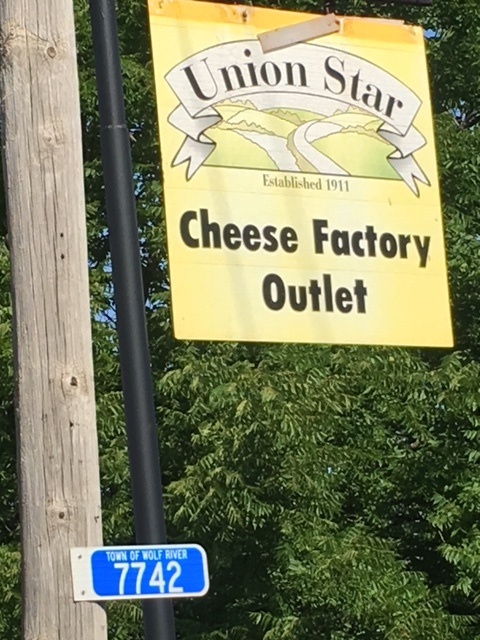 Wisconsin – Cheese and Farmer’s Market – Let's Go RVing! Another early morning as we were up and out and on our way to the Union Star Cheese Factory to see how cheese is made. It is actually located further away than I thought plus we had an incorrect address so we barely made it to the 8:30 tour. It’s in a very rural area and one would think that there would be little traffic there but when we went in the little shop was packed and the people behind the counter looked like worker bees. I first though folks were there for the tour but quickly realized that they were making purchases. We were later told that the store is on the Circle of Lakes making it easily accessible to people on day trips. The son of the owner gave us our brief tour. It’s a small place, all encased in one room. It was difficult to hear everything the young man was saying as the noise level was fairly high. Right behind the counter was a large tub like fixture full of curds which they were bagging as quickly as possible. We tasted some and they were pretty good but didn’t seem to have a lot of taste. They only last about three days and I knew we’d never eat that many in three days. He took us in the cooler so we could see the aging cheese. I must admit that I had a moment of fright when he closed the door. It was 40 degrees in there – what if the door wouldn’t open so we could get out. Yep, the old claustrophobia raised its head again. We ended up buying a beef log plus three different kinds of cheeses. Since we were traveling to Stevens Point next we realized that we would have to have a cooler unless we made the 40+ mile trip back to the campground. Once we got into Stevens Point we stopped at a Target and got a collapsible cooler. Our next stop was to find some New Galeras Raspberry Tart beer for Trent. It’s supposed to be very good but can only be bought in Wisconsin. When he heard we were going to be in the state for a day he asked me to try to find some as he wanted to give it to his employees for Christmas. It took us two stops but if we had known where to look it wouldn’t have. Our first stop was a grocery store and we found out later that it had a liqueur store connected to it. We didn’t go into that so we missed it. We finally got the 12 bottles Trent wanted and then with no definite place to go we ended up downtown. 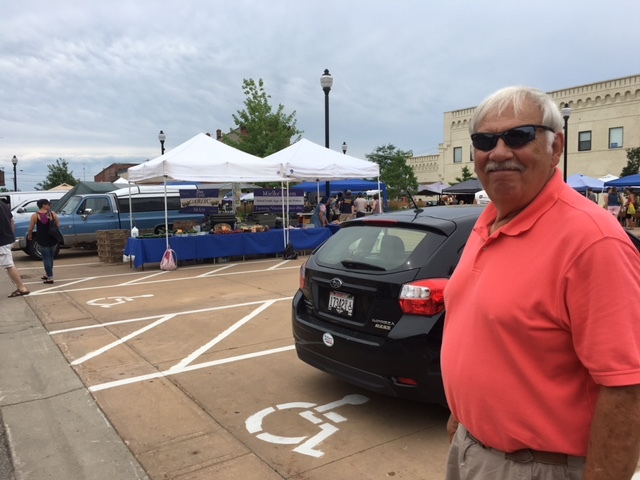 There were several tents set up so we parked and walked down to the Farmer’s Market. There were lots and lots of pretty fresh vegetables there and I bought some small cucumbers. They’ll be good in our salad. 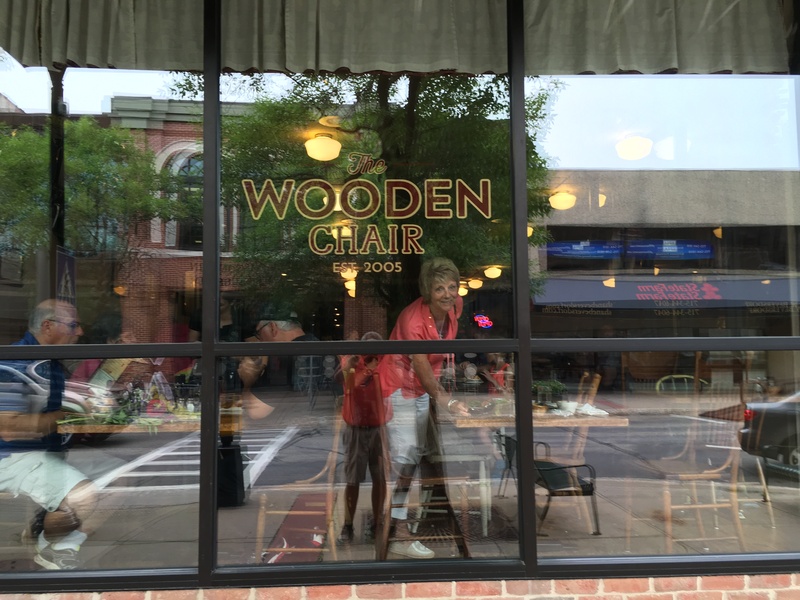 On our way back to the car we decided to have lunch at The Wooden Chair. We have eaten out several times on the trip and sadly I must say this was by far the least desirable meal we’ve had. I didn’t even finish mine – my salad was good though! We had planned to go to the Green Circle Trail to ride bikes but with the temperature in the high 80’s we decided to wait until we got back to the campground and it cooled off a bit. As we got back to the campground it began to rain so we went inside and read and then took naps. After dinner the rain stopped so at 7:30 Jerry decided he would ride his bike so of course I had to go also. I rode 6 ½ miles! After the ride Jerry put the bikes on the bike rack on the motor home and then we put the car on the dolly. Leaving tomorrow will be quicker and easier. The question is where are we going! Previous postGetting a Haircut When Traveling – Oh My!